House built in 1873, freshly renovated in 2006, elegant, spacious and bright 4-bedroom Apartment on Zurichberg, 2nd Floor, 200 square meters. Apt. has original hardwood floors, a wood-burning stove, piano, full of antiques. The 3 modern bathrooms offer 2 showers, 1 bathtub, washer/dryer, 2 private balconies in the nicest part of Zurich, central to everything Zürich has to offer. In one of the largest bedrooms we can easily set up a single bed for a total party of 9 adults. 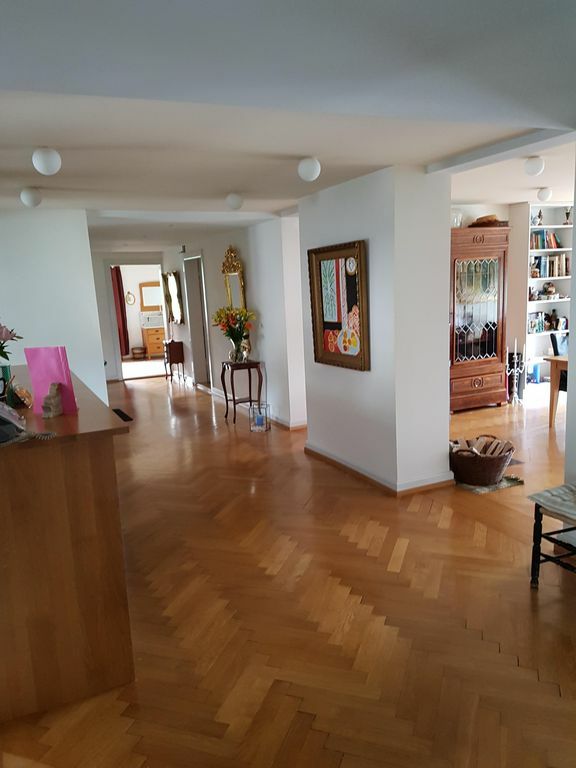 The neighborhood of Hottingen is close to all University Hospitals, the University + ETH, the Art Museum, Bellevue, the Opera House, Lake of Zurich, Botanical gardens, forest, etc. Always available: 1-bedroom apt. with private entrance, full-bathroom, balcony, eat-in kitchen. This separate studio apartment has a King bed, own balcony looking into the trees, a charming eat-in kitchen with stove, oven, fridge, plenty of dishes, pots, pans, cutlery, basic stock of spices, oils, etc., combined washer/dryer, bright cheery feel. Modern bathroom with walk-in shower, generous sink, bright feel too. You will not need a car while you are here. You are just a train, bus, boat, bike,cable car or streetcar's ride away from countless points of interest: breathtaking alpine trips, dips into alpen lakes, along Zürich's bustling streets are hundreds of galleries, restaurants, sidewalk cafes, nightclubs, discos, and theaters; visit Zurich's renown concert halls, opera house, zoological gardens, museums, sporting and cultural events followed by dining on swiss specialties. Located just a 9-min.walk from Bellevue, the lake, the forest, the downtown area. Amazing location. Take a quick hike up the nearby Uetliberg Mt. which overlooks the whole city and lake of Zürich. You are also a brisk walk down to the crystal clear 30 mile long Lake of Zürich (which can also be circled by bike! ), or a quick ride up to the forest and famous Dolder 'wave' pool or ice skating rink for a totally refreshing change from the fast pace. Bargain shop along Zurich's Bahnhofstrasse, Europe's most exclusive shopping mile. An elegant apartment in a house built in 1873, 120-year old hardwood floors, generously large rooms, comfortable bed with king-sized pillows, a balcony for two with flowers and plants, and a small yard downstairs. The guest will be torn between staying at home or exploring the culinary and cultural adventures Zurich has to offer. Zürich can be home base to a wide range of destinations. Two major ski areas within an hour's trip are Hoch Ybrig or Flumserberg. For high alpen skiing areas count a 2-hr. trip. You are three hours from both Verona via Milan and Munich. The Black Forest of Germany, Geneva, the Austrian, French, or Italian boarders are only a trip away, trains generally leaving once per hour. Only 45 minutes to the famous city of Lucerne. In Zürich you are literally situated in the heart of Europe, yet may enjoy the cosmopolitan life the citizens of Zürich cherish! July - Aug. 2018: Bright, spacious, elegant 4 Bedroom w/3 full Bathrooms, wood burning stove. bar, min. booking 2 weeks for your summer stay in Zurich. We have always lovee to travel but very much dislike staying in hotels. Vacation Rentals have made our travel experiences marvelous. We fell in love with this apartment when we first rented it back in 1984. The generous layout, brightness, privacy and gorgeous rooms has been a passion to fill with both beautiful things and great guests. Come enjoy a very well-stocked and comfortable apartment and let the charm of Zurich unwind in total comfort. A Permit for street parking available at the nearby police station. Living room with great DVD collection and Netflix. Also, we have a beautiful, freshly tuned piano that loves to be played. Lovely Balcony with table and lovely plants, herbs, etc. Great tennis courts up at the Zoo... Fr. 20.- for an hour of fun.